1st Mon Log thanks to Steve & Val & Dave Crawford. G-MAJT : JT : Eastern : Jetstream 41 c/s “East Flt 102” in “103 ” out. ZJ916 : 916 : code only : Typhoon FGR4 c/s “Typhoon 84” – display. ZK313 : 313 : code only : Typhoon FGR4 c/s “Lossie 83” – Parked on the ASP – For TMF. XX162 : 162 : Inst of Med : Hawk T1 – Hangered. 2nd April Log thanks to Susie. Noted around the airfield – Thanks to Steve & Val & Dave Crawford. Noted on the ASP – ZJ914/914, ZJ928/928, ZK381/381, ZJ942/942, ZJ931/931, ZK432/432, ZK382/382, ZK383/383, ZJ929/929, ZK372/372,ZK371/u/m,ZK380/380,ZK429/429. Noted in Echo – ZJ949/949, ZK354/354, ZK366/366, ZK342/342, ZK369/369 . Noted in Foxtrot – ZK309/309, ZK308/308, ZK346/346, ZK352/352, ZK427/427. G-MAJT : JT : Eastern : Jetstream 41 c/s “East Flt 101” in “102” out. ZK372 : 372: II(AC)Sqn : Typhoon FGR4 c/s “Cobra 31” Landed with chute. ZK316 : 316 : code only : Typhoon FGR4 c/s “Tango Mike 42” – Practice QRA. ZK309 : all black : Typhoon FGR4 – towed from the TMF to APU tunnel. 4th Thur Log thanks to Garf ,Dave Crawford &. Susie Matson. G-BUOS/SM845 : R : Spitfire FR MK XVIII c/s “GBUOS” – Overfly at 11-50am. ZK316 : 316 : code only : Typhoon FGR4 c/s ” ************ ” – QRA taxy close to HAS1 waited then stand down. 8th Mon Log thanks to Steve & Val. ZK371 : unmarked : Typhoon FGR4 – Noted on the Wash pan – Later towed to the ASP..
ZK373 : 373 : code only : Typhoon FGR4 – Towed over to the Hush house then to the ASP. ZK348 : 348 : code only : Typhoon FGR4 – Towed from TMF to the ASP for engine runs. ZK362 : 362 : 6Sqn : Typhoon FGR4 – QRA radio check. ZK357 : 357 : code only : Typhoon FGR4 – Towed from TMF to Echo. LF363 : JX-B : BBMF : Hurricane II c/s “Hurricane 01” – ground abort. “Havoc 21” – ground abort. ZK929 : 929 : code only : Typhoon FGR4 c/s “Typhoon 84” – Display. ZK362 : 362: 6Sqn: Typhoon FGR4 – QRA radio check. ZK329 : 329 : code only : Typhoon FGR4 – Towed from TMF to the ASP. ZK313 : 313 : code only : Typhoon FGR4 – Towed TMF to APU Tunnel. ZK435 : 435 : code only : Typhoon FGR4 – Towed from Hangar 2 to TMF southside. ZK348 : 348 : code only : Typhoon FGR4 – Towed back to TMF. ZK371 : unmarked : Typhoon FGR4. ZK372 : 372 : II(AC)Sqn : Typhoon FGR4. ZK329 : 329 : code only : Typhoon FGR4. ZK379 : 379 : 41 TES : Typhoon T3. ZK373 : 373 : code only : Typhoon FGR4. ZJ937 : 937 : code only : Typhoon FGR4. 9th Tue – Log thanks to Steve & Val. ZK329 : 329 : code only : Typhoon FGR4 c/s “Typhoon 109” – delivery to Lossiemouth. ex TMF. ZK379 : 379 : 41 TES : Typhoon T3 – Towed onto the Wash pan. ZK358 : 358 : code only : Typhoon FGR4 c/s “Havoc 22” – f/n coded 358. LF363 : JX-B : 1Sqn : Hurricane IIc c/s “Hurricane 01” – 2 Displays. ZK435 : 435 : code only : Typhoon FGR4 – Towed from Southside of TMF to Hangar 3/2. G-MAJA : JA : Eastern : Jetstream 41 c/s East Flt 105″ in “106” – out. 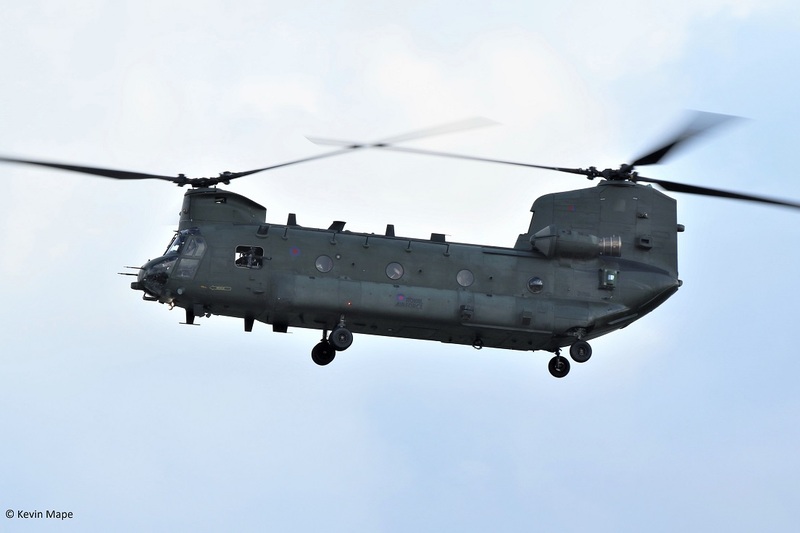 ZH664 : 7Sqn : Chinook HC6 c/s “Vortex 533” – From Holbeach Range – Parked on Sierra. ZK366 : 366 :XI(F)Sqn : Typhoon FGR4. ZH664 : 7Sqn : Chinook HC6 c/s “Vortex 533” – to Holbeach Range at Sunset. 10th Wed Afternoon log thanks to Susie Matson. TE311 : SZ-G : BBMF : Spitfire LF XVIe c/s “Spitfire 97”- practice display. ZJ914 : 914 : code only : typhoon FGR4. ZK382 : 382 : code only : Typhoon T3. ZK383 : 383 : code only : Typhoon T3. ZK429 : 429 : code only : Typhoon FGR4. ZJ931 : 931 : code only : Typhoon FGR4. ZK371 : unmarked : Typhoon FGR4 . 15th Mon Log thanks to Steve & Val. using HAS 52 to HAS 55. ZJ920 : 920 : code only : Typhoon FGR4 c/s “Warlord 12”- Gunnery practice. ZK432 : 432 : code only : Typhoon FGR4 c/s “Warlord 13”- Gunnery practice. PM631 : BBMF : Spitfire PR XIXe c/s “Spitfire 96” – Display. ZJ949 : 949 : code only : Typhoon FGR4 – Towed from the paint shop to Echo. PM631 : BBMF : Spitfire PR XIXe c/s “Spitfire 90” – Display. “Warlord 23” – Ground abort. G-MAJA : JA : Eastern : Jetstream 41 c/s “East Flt 104” in “105” out. ZK381 : 381 : code only : Typhoon T3. ZJ939 : 939 : code only : Typhoon FGR4. ZK307 : 307 : code only : Typhoon FGR4. ZK308 : 308 : code only : Typhoon FGR4. ZK346 : 346 : code only : Typhoon FGR4. ZK315 : 315 : code only : Typhoon FGR4. ZK317 : 317 : code only : Typhoon FGR4. ZK424 : 424 : code only : Typhoon FGR4. XX339 : CL : 100Sqn : Hawk T1A c/s “Aggressor 1” – Parked on Sierra. XX321 : CI : 100Sqn : Hawk T1A c/s “Aggressor 2” – Parked on Sierra. 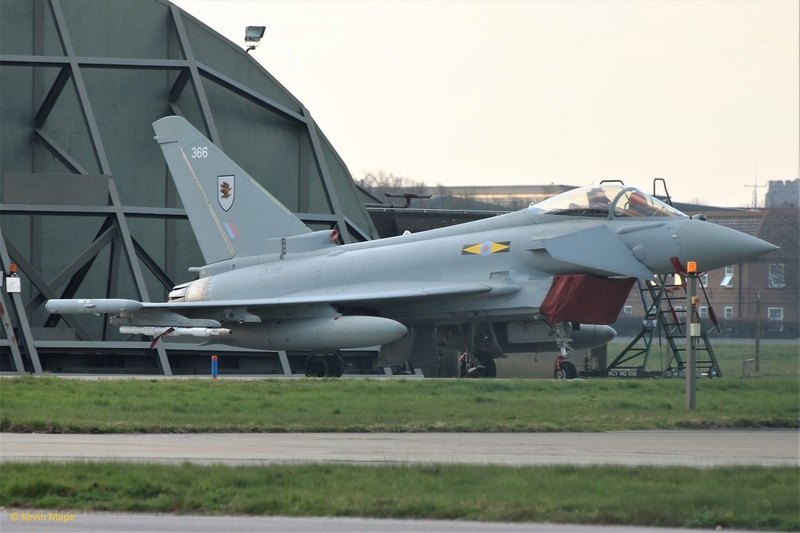 ZK432 : 432 : code only : Typhoon FGR4 – Towed from Foxtrot to Hangar 1. Night flying finished after midnight. 16th Tue Log thanks to Steve & Val. ZJ931 : 931 : code only : Typhoon FGR4 – Noted on wash pan. XX339 : CL : 100Sqn : Hawk T1A – Parked on Sierra. XX321 : CI : 100Sqn : Hawk T1A – Parked on Sierra. ZK308 :308 : code only : Typhoon FGR4 – Towed from Foxtrot to Hangar 2 then later back to Foxtrot..
ZK318 : 318 : code only : Typhoon FGR4 – Towed from TMF to APU Tunnel. G-ENOA : Cessna F172F c/s GENOA” – To BBMF. PM631 : BBMF : Spitfire PR XIXe c/s “Fighter 2” – Synchro pair. ZJ931 : 931 : code only : Typhoon FGR4 – Towed from wash pan back to 29Sqn. ZJ914 : 914 : code only : Typhoon FGR4 c/s “Typhoon 84” – Display. ZJ916 : 916 : code only : Typhoon FGR4 c/s “Warlord 21” – Operating out of Foxtrot. G-ENOA : Cessna F172F c/s GENOA” – Departed. G-MAJA : JA : Eastern : Jetstream 41 c/s “East Flt 105” in “106” out. XX187 : CN : 100Sqn : Hawk T1A c/s “Pirate 10” – Departed. XX205 : CK : 100Sqn : Hawk T1A c/s “Pirate 20” – Departed. G-FRAR : AR :Cobham : Falcon 20EW c/s “Vader **” – Departed. Noted with the TMF at the start of April include. ZK329 : 329 : code only : Typhoon FGR4 – Noted on the ASP 8/4/2019. ZJ805 : BD : 29Sqn : Typhoon T3 – On RTP. 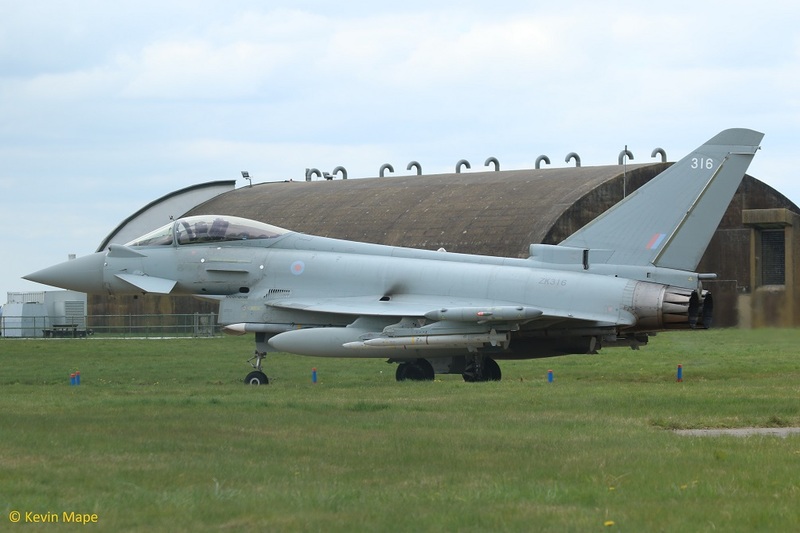 ZK435 : no markings : Typhoon FGR4 – Towed into the TMF 8/4/2019. ZJ937 : 937 : code only : Typhoon FGR4 – Engine runs on the ASP 8/4/2019.